Michael Perry has asked that if any of you are painting the three running British figures shown here, they should also be wearing 'sand' coloured tunics (not shirts). 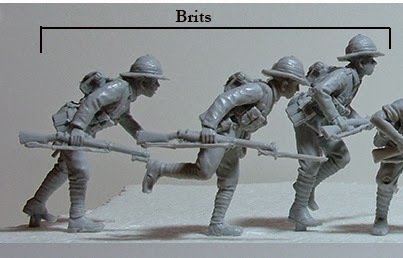 Please pass this info on if you know anyone who is still painting any of these three particular figures, just in case they don't visit this blog. The fact they're wearing tunics might well have been easier to see on these running figures than on the British casualties mentioned by Alan Perry the other day, but Michael has included a picture of the originals anyway. So what GW colour should we use? Michael has asked me to pass on that it's basically the same as the Fernleaf shorts/trousers i.e. a 50/50 mix of Ogryn Camo and Usabti Bone, then wash with sepia and highlight with a lighter version of the mix.